Center for Molecular Imaging Research (CMIR) is now part of CSB! Molecular imaging has largely become possible by the advances in molecular and cell biology techniques, new methods of combinatorial drug design, high throughput testing and the emergence of novel imaging techniques and probes. Although specific examples of imaging specific targets date back to the early 70’s (e.g. in nuclear medicine), it was not until the mid 90’s that concerted efforts were made to embrace key technologies and broadly develop the field from a biological and molecular perspective. Significant funding for the field became available from NIH and other agencies in the late nineties. dissemination to the broadest possible base of researchers. Molecular imaging is defined as the measurement and/or imaging of biological processes in living organism at the molecular and cellular level. It is about combining genetic information and new chemistries into new imaging probes, detectable by sophisticated imaging technologies. Advancements arising from this research can enhance our knowledge of disease, lead to earlier disease detection and accelerate drug discovery. The research field has had a significant impact on biomedical research and the clinical practice of imaging. 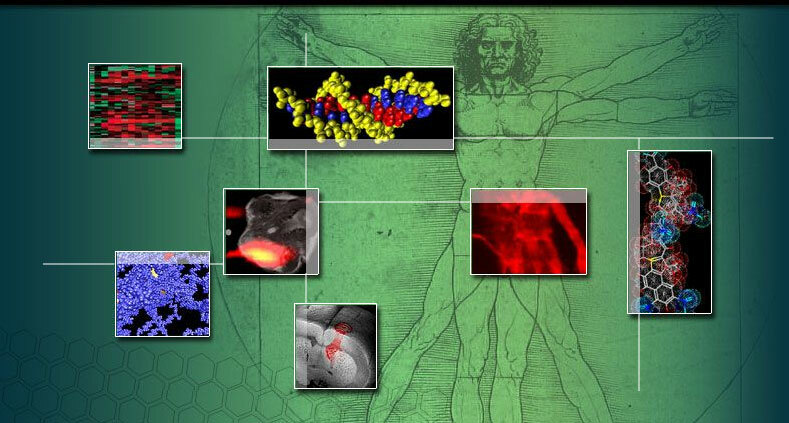 The multidisciplinary research involves different fields including target discovery, chemistry, cell biology, modeling of disease, imaging, data processing and clinical research. development of novel and dedicated small animal imaging systems with high spatial resolution and sensitivity. Much of the research performed at the CMIR addresses these specific needs and opportunities. Biomedical research evolves and advances not only through the assemblage of knowledge, but also through the development of new technologies. Using traditional methods of imaging, clinicians are able to survey the body for anatomic and physiologic abnormalities occurring in disease, albeit at an often late stage. The emergence of new tools enables researchers to address previously intractable problems and to uncover novel potential targets for imaging. Different molecular imaging tools now allow scientists to analyze expression of many gene products in vivo. For example, novel optical imaging technologies and smart sensing reporter probes represent a major methodological advance and illustrate how the advent of new technologies provides powerful tools for researchers.